libuv is cross-platform support library which was originally written for NodeJS. It’s designed around the event-driven asynchronous I/O model. The library provides much more than a simple abstraction over different I/O polling mechanisms: ‘handles’ and ‘streams’ provide a high level abstraction for sockets and other entities; cross-platform file I/O and threading functionality is also provided, amongst other things. libuv provides users with 2 abstractions to work with, in combination with the event loop: handles and requests. A prepare handle gets its callback called once every loop iteration when active. A TCP server handle that gets its connection callback called every time there is a new connection. Requests represent (typically) short-lived operations. These operations can be performed over a handle: write requests are used to write data on a handle; or standalone: getaddrinfo requests don’t need a handle they run directly on the loop. The I/O (or event) loop is the central part of libuv. It establishes the content for all I/O operations, and it’s meant to be tied to a single thread. One can run multiple event loops as long as each runs in a different thread. The libuv event loop (or any other API involving the loop or handles, for that matter) is not thread-safe except where stated otherwise. The event loop follows the rather usual single threaded asynchronous I/O approach: all (network) I/O is performed on non-blocking sockets which are polled using the best mechanism available on the given platform: epoll on Linux, kqueue on OSX and other BSDs, event ports on SunOS and IOCP on Windows. As part of a loop iteration the loop will block waiting for I/O activity on sockets which have been added to the poller and callbacks will be fired indicating socket conditions (readable, writable hangup) so handles can read, write or perform the desired I/O operation. The loop concept of ‘now’ is updated. The event loop caches the current time at the start of the event loop tick in order to reduce the number of time-related system calls. If the loop is alive an iteration is started, otherwise the loop will exit immediately. So, when is a loop considered to be alive? If a loop has active and ref’d handles, active requests or closing handles it’s considered to be alive. Due timers are run. All active timers scheduled for a time before the loop’s concept of now get their callbacks called. Pending callbacks are called. All I/O callbacks are called right after polling for I/O, for the most part. There are cases, however, in which calling such a callback is deferred for the next loop iteration. If the previous iteration deferred any I/O callback it will be run at this point. Idle handle callbacks are called. Despite the unfortunate name, idle handles are run on every loop iteration, if they are active. Prepare handle callbacks are called. 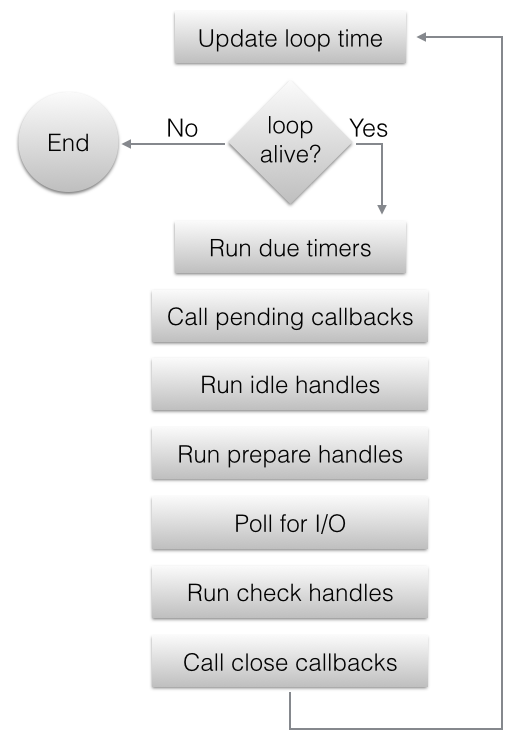 Prepare handles get their callbacks called right before the loop will block for I/O. If the loop was run with the UV_RUN_NOWAIT flag, the timeout is 0. If the loop is going to be stopped (uv_stop() was called), the timeout is 0. If there are no active handles or requests, the timeout is 0. If there are any idle handles active, the timeout is 0. If there are any handles pending to be closed, the timeout is 0. If none of the above cases matches, the timeout of the closest timer is taken, or if there are no active timers, infinity. The loop blocks for I/O. At this point the loop will block for I/O for the duration calculated in the previous step. All I/O related handles that were monitoring a given file descriptor for a read or write operation get their callbacks called at this point. Check handle callbacks are called. Check handles get their callbacks called right after the loop has blocked for I/O. Check handles are essentially the counterpart of prepare handles. Close callbacks are called. If a handle was closed by calling uv_close() it will get the close callback called. Special case in case the loop was run with UV_RUN_ONCE, as it implies forward progress. It’s possible that no I/O callbacks were fired after blocking for I/O, but some time has passed so there might be timers which are due, those timers get their callbacks called. Iteration ends. If the loop was run with UV_RUN_NOWAIT or UV_RUN_ONCE modes the iteration ends and uv_run() will return. If the loop was run with UV_RUN_DEFAULT it will continue from the start if it’s still alive, otherwise it will also end. libuv uses a thread pool to make asynchronous file I/O operations possible, but network I/O is always performed in a single thread, each loop’s thread. While the polling mechanism is different, libuv makes the execution model consistent across Unix systems and Windows. Unlike network I/O, there are no platform-specific file I/O primitives libuv could rely on, so the current approach is to run blocking file I/O operations in a thread pool. For a thorough explanation of the cross-platform file I/O landscape, checkout this post. See the Thread pool work scheduling section for more details, but keep in mind the thread pool size is quite limited.